Summary THE BABY BOSS is an animation in which a young boy and his new baby brother team up to defeat an evil businessman. 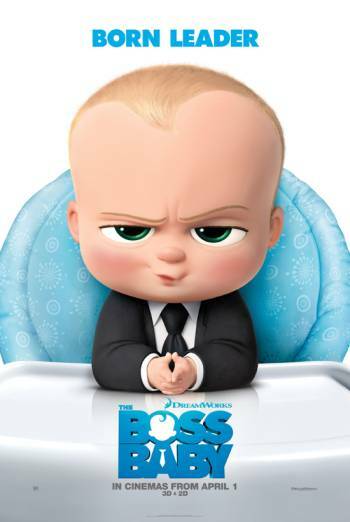 THE BABY BOSS is an animation in which a young boy and his new baby brother team up to defeat an evil businessman. A young boy frequently imagines he is being chased by wild animals, pirates or space aliens and pretends he is fighting them off. He also imagines he is ninja creeping through spooky, dark houses with pictures of demons on the walls. This is all established as taking place in a child's fertile imagination. A young boy and baby are also comically chased by some villains, with slapstick action as they ride and throw toys at each other. There are occasional moments of rude humour including a dog sniffing the bottom of a baby who is dressed as a puppy, and two characters emerging from the bottom of a giant inflatable dog as if they are dog poo. There are lots of naked baby bottoms seen as babies move through a factory, with one facing the wrong way when dummies are put in the babies' mouths; the baby realises the dummy might be pushed into his bottom instead so turns around. There are also jokes about how babies are made, with the details whispered between characters and left unheard by the audience.